John Willis Ellis (23 Nov. 1820-7 July 1861), legislator, superior court judge, and governor, son of Anderson and Judith Bailey Ellis, was born in the section of eastern Rowan County that later became part of Davidson County. He grew up on the plantation that his father had inherited from Ellis's grandfather, Willis, in 1806. Young Ellis attended Randolph Macon College and was graduated from The University of North Carolina on 3 June 1841. He spent the following year studying law under Richmond Mumford Pearson at Mocksville. This was the forerunner of Pearson's famous law school begun in 1847 at his home, Richmond Hill, in Yadkin County. Ellis commenced the practice of law in Salisbury in July 1842. On 1 Aug. 1844, a few months short of his twenty-fourth birthday, he was elected a member of the North Carolina House of Commons as a Democrat from a predominantly Whig county. Shortly after the election, on 25 Aug. 1844, Ellis was married in Philadelphia to Mary White, the daughter of Philo and Nancy White formerly of Salisbury. White was editor of the Salisbury Western Carolinian (1820-30) and the Raleigh North Carolina Standard (1834-36) and a member of the diplomatic corps (1849-58). Ellis and his wife were married only a few weeks when she died of an unknown malady, possibly typhoid fever, on 19 Oct. 1844 upon their return to North Carolina. As soon as he took his seat in the House of Commons on 18 Nov. 1844, Ellis began to champion internal improvements, a concern throughout his political career. He was again elected a member of the General Assembly in 1846 and 1848. A few days into the 1848 session he was chosen by Dorothea L. Dix to present a memorial to the house urging the construction of an asylum for the protection and care of the insane in North Carolina. As chairman of the Joint Select Committee to study this proposal, Ellis on 8 Dec. 1848 favorably reported out a bill to provide for the establishment of a state hospital for the insane. The bill became law on 21 December. On 16 Dec. 1848, Ellis, who a few weeks earlier had celebrated his twenty-eighth birthday, was elected a judge of the Superior Court of North Carolina by the General Assembly. During his tenure in the legislature and on the bench one of his most influential political mentors was William W. Holden, the powerful editor of The North Carolina Standard. 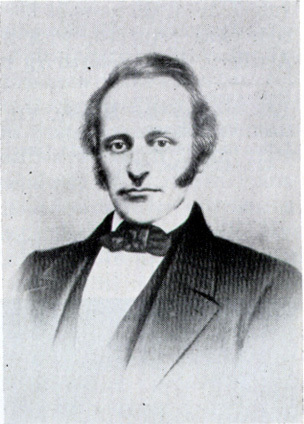 As early as January 1852, Holden was urging Ellis to run for the U.S. Senate and the following year he tried to persuade him to run for governor, but Ellis declined both offers. Six years later the two men would oppose each other for their party's nomination for governor. The Democratic convention, which convened in Charlotte on 14 Apr. 1858, nominated Ellis for governor the following day. After serving almost ten years on the bench, he resigned on 29 April. He was elected governor on 5 Aug. 1858. Six days later the widower of fourteen years married Mary McKinley Daves, daughter of John P. Daves, in New Bern. On 1 Jan. 1859, Ellis was inaugurated governor. In his address he acknowledged that animosity existed toward the Northern view of slavery, but he voiced the overriding feeling in the state at that time when he said, "Grievous as are these causes of discontent, we are not prepared for the acknowledgement that we cannot enjoy all our constitutional rights in the Union." He continued to counsel moderation with firmness in dealing with the central government. During his first administration, Ellis was vitally interested in internal improvements, especially in the completion of the navigation works on the Cape Fear and Deep rivers from Fayetteville to the coal fields in Chatham County. He also continued a progressive program of improving plank roads, navigation, turnpike roads, and the state's educational system. Another high point during his first term was the visit of President James Buchanan to Chapel Hill to deliver the commencement address at the university on 1 June 1859. Ellis escorted the president on his many stops en route to Chapel Hill. The dominant theme of the president's remarks at every stop was the preservation of the Union and the Constitution. Shortly after Buchanan's departure, the governor's wife gave birth on 8 June to a daughter, Mary Daves. A second daughter, Jean Graham, was born on 9 Oct. 1860. Ellis was reelected governor for a second term on 2 Aug. 1860 by a smaller majority than he had received in 1858. There is some speculation that he lost votes because of his strong advocacy for states rights at a time when most North Carolinians supported the central government. His message to the General Assembly on 20 Nov. 1860 was not a call for secession, but a plea for the "prevention . . . of civil war and preservation of peace." However, he did recommend that North Carolina consult with other Southern states on the question of secession and then let the people express their opinion in a convention. He also recommended reorganization of the militia. On 1 Jan. 1861, Ellis was formally installed as governor for a second term, taking the oath before the judges of the state supreme court, there not being a quorum of the General Assembly in Raleigh on that day. On 29 January, at the governor's bidding, the Assembly passed a convention bill; a few days earlier it had sent a delegation to the peace conference in Washington, which Ellis had little confidence would succeed. The following day Ellis urged the members of the Southern Convention meeting in Montgomery, Ala.—to which the Assembly had also sent a delegation—not to delay their business by waiting for the Virginia delegates to arrive because "Va. N. Ca. and other border slave states will much sooner join an organized government than secede without such government." The majority of North Carolinians did not seem to agree with their governor's strong views because on 28 February they defeated the call for a convention. On 13 Apr. 1861, Fort Sumter fell to South Carolina troops. This act of aggression against the central government caused President Lincoln to call for 75,000 troops to coerce the seceded states (Lincoln's Call For Troops). When requested on 15 April to furnish two regiments for this undertaking, Ellis replied by telegram the same day that Lincoln would "get no troops from North Carolina." Ellis immediately ordered state troops to seize the federal forts in North Carolina as well as the federal arsenal at Fayetteville. On 17 April, he telegraphed Confederate President Jefferson Davis that he was "in possession of Forts, Arsenals, etc. come as soon as you choose. We are ready to join you to a man. Strike the blow quickly and Washington will be ours." Called into session by Ellis on 1 May, the General Assembly immediately passed a convention bill and authorized Ellis to send troops to Virginia at once to help defend that state. The convention was called and convened in Raleigh on 20 May 1861 and unanimously adopted an ordinance of secession. Whereupon Ellis promptly telegraphed President Davis the news. In delicate health for some time, Ellis was compelled during the latter part of June to journey to Red Sulphur Springs, Va., in an attempt to regain his strength. A few days later he died at the age of forty-one. He was buried in the family cemetery in Davidson County; sometime later he was reinterred in the Old English Cemetery, Salisbury. Recommended Reading: Bluecoats and Tar Heels: Soldiers and Civilians in Reconstruction North Carolina (New Directions in Southern History) (Hardcover). Description: In Bluecoats and Tar Heels: Soldiers and Civilians in Reconstruction North Carolina, Mark L. Bradley examines the complex relationship between U.S. Army soldiers and North Carolina civilians after the Civil War. Postwar violence and political instability led the federal government to deploy elements of the U.S. Army in the Tar Heel State, but their twelve-year occupation was marked by uneven success: it proved more adept at conciliating white ex-Confederates than at protecting the civil and political rights of black Carolinians. Bluecoats and Tar Heels is the first book to focus on the army’s role as post-bellum conciliator, providing readers the opportunity to discover a rich but neglected chapter in Reconstruction history. Try the Search Engine for Related Studies: North Carolina Governor John Willis Ellis Photo, Photos, Picture, Pictures, History, Biography, Facts, Summary, Details Secession Convention Crisis, States Rights Acts, Policy, Policies American Civil War Democratic Convention.